"The most important thing that I wish for my children is an "inner strength" to be self-fulfilled, strong, happy, kind and peaceful." 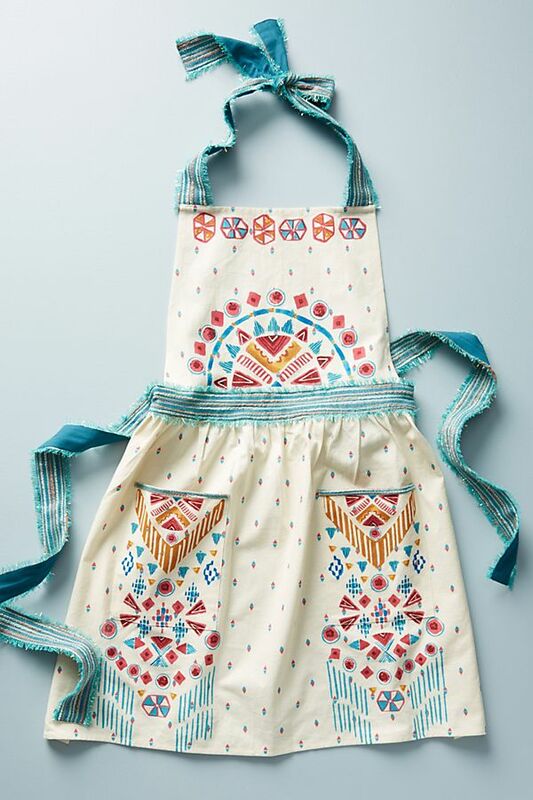 Mushy stuff aside, the thing that I think perfectly depicts my mom's amazing balance of strong woman and nurturing mom is her apron collection. The lady loves aprons, and so for every holiday we have a pretty easy go-to gift. Usually we choose one from Anthropologie (check out my five fav below!) because they go with her slightly bohemian style (she went to UC Berkeley in the 70's she can't help it - see below the photo from my parents wedding where she wore an orange pantsuit #reallifedumbanddumber). But what I love so much about her apron wearing habit, and I do call it a habit as it is the first thing she does when she gets home from work, is that it so poignantly reminds me that feminism can look like a mom, in an apron, making dinner. I think feminism is so important, the idea that a woman is equal to a man, and yet the word to some seems harsh or one-sided. What I was shown growing up, is that a woman can be so many things and truthfully for better or worse we are expected to be all things. That's why we often call them "super-mom's" because lets face it, women who work still bear the brunt of the homemaking as well. I grew up with a strong feminist mom who came home every evening from running her business and donned her favorite stylish apron - pockets preferred, and none of that half apron BS. That's just one example of what a feminist mom can look like, and I hope that mom's the world over can be celebrated this weekend for whatever type of mom they are. A stay at home mom, a working mom, or something in between. I'm grateful to have a mother who made it seem to effortless to live in both worlds and I hope one day I can be half of the momma she has been to me! To shop my five favorite aprons that Anthro has RIGHT NOW head to my LikeToKnow.It Page or click on the links below. Fiull size images if you scroll further plus more of me and my mom!